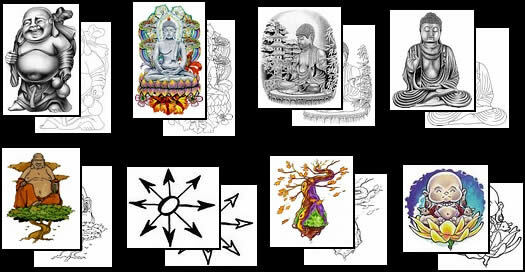 Buddhist Tattoo Meanings - Many of the symbols we now know as 'Buddhist' originated from the Hindu tradition, since it was into the Hindu culture and religion that Prince Siddhartha Gautama, later known as the Buddha, was born. Not until several centuries after his death did symbols relating specifically to the Buddha, and the religion he inspired, come into being. The first archeological evidence of Buddhist symbols were from the time of the Hindu King Ashoka, who was inspired by the teachings of Buddha. The king lived around 250 BC in Sarnath, India, a site still visited today for its wealth of archeological discoveries pertaining to early Buddhism. Ashoka's devotion to the Buddha's teachings gave birth to the creation of many of the symbols and images familiar in Buddhism today. It was not until around 100 BC that any actual images of the Buddha himself appeared. In his lifetime, Buddha - a term that simply means one who has attained enlightenment - had discouraged any attempts by his disciples to venerate him personally. Buddhism, unlike Hinduism into which he was born, includes no references to gods, goddesses, or mono-theism. It was the teachings that were important, not his physical incarnation. All of us, on the path to enlightenment, has the potential to become a Buddha. The earliest symbols of those teachings were the Eight Spoked Dharma Wheel and the Bodhi Tree. Other representations of the Buddha appeared as the Buddha's Footprints, the Lotus, an Empty Throne, a Begging Bowl, and a Lion. The three jewels - the Buddha, the Dhamma, and the Sangha. The snake king. Vestige of pre-Buddhist fertility rituals and protector of the Buddha and the Dhamma. Around 600 AD there appeared an abundance of new imagery and artwork associated with the Buddha and his teachings. This was due to the spiritual practice of 'imagination and visualization' as a technique for self-realization - achieving Nirvana - which had become popular at that time. This tradition is preserved mainly in Tibetan Buddhism and the Japanese Shingon tradition. The Buddha image eventually became very popular in Buddhism, although to this day, those early symbols have remained in use, especially in Theravada Buddhism which is practiced in countries like Sri Lanka and Thailand. As Buddhism spread out from India into neighbouring countries like Tibet, the symbolism became further enriched and elaborated upon. In places like Tibet, the 'Eight Auspicious Symbols' became central to their religious practice, most commonly appearing on prayer flags and incorporated into mandalas for meditative contemplation. Tibetan Buddhism also established the Wheel of Life as a meditation on the universe and its karmic laws.